Home page > News > Air heating of industrial premises. Or the infrared heating after all? Air heating of industrial premises. Or the infrared heating after all? Industrial enterprises, as well as living quarters, require modern equipment for heating. However, heating of industrial buildings has its own rules and substantial differences in comparison with the heating of apartments, villas, cottages and other dwellings. The difference lies in the distinction in size and ceiling height among industrial workshops, warehouses and living quarters. High ceilings (at least 5-6 meters) and large areas are required for convenient arrangement and operation of industrial machines and mechanisms, staff activity, etc. Heating of industrial premises - is a separate item of expenses in the budget, which in a market economy must be taken into account in the generation of the cost price of goods and services, and thus affect the competitive ability of the enterprise. Heating of industrial buildings - is a mandatory requirement for stable operation of the mechanisms that can't operate at a low temperature. Workers of the industrial enterprise also need comfortable working conditions. The sanitary code indicates that the heating of industrial premises should be organized so as to ensure a stable temperature, not dropping below 17-18C. 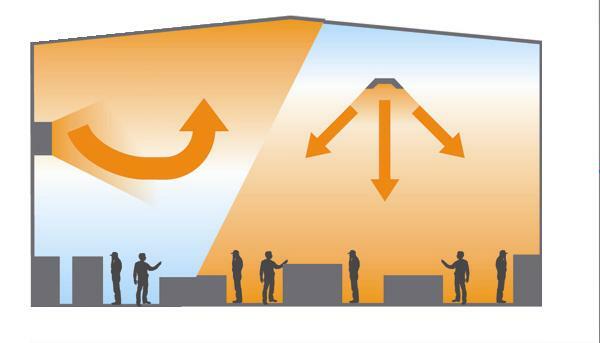 Air heating of industrial premises. Until recently, it was common to use air heating of industrial premises at domestic enterprises. The heating systems used such heat-transfer materials as water, steam or air. The equipment heated the air in the room, which was fanned into workshops through the collectors. The disadvantage of such a heating of industrial premises is poor energy efficiency: the heated layers of air are always moving upward. Taking into account that it is necessary to heat only the part of the industrial building where workers and machines are located (namely, 1-2 meters from the floor), the air heating of workshops proved it was far from economical. This system heats about 60% of "unnecessary" air near the ceiling. If the roof does not have the necessary heat insulation, the heated air goes up and disappears forever. Also, air heating of workshops involves the movement of air masses of different temperatures, which causes permanent drafts and spreading of bacterial infection and thus has a negative impact on workers' health. 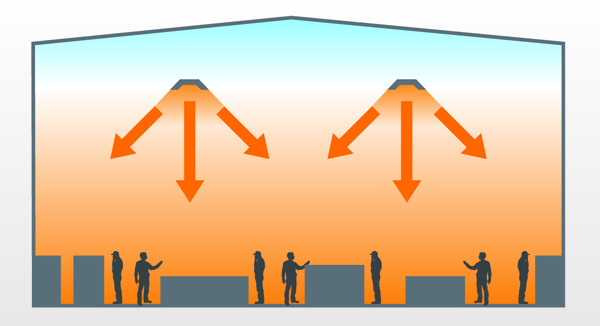 Air heating of warehouses where people are mostly absent is not without flaws either: wasteful energy consumption for heating and constant circulation of dusty air due to the temperature difference. 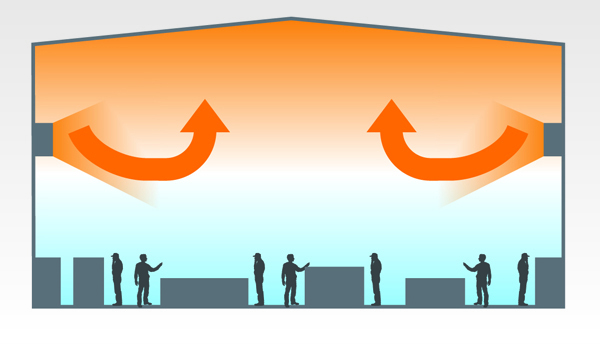 The infrared heating of industrial premises. In the developed countries of Europe and America, air heating of industrial premises for more than 20 years has been considered inefficient and consequently replaced by modern heating systems with the help of the infrared heaters. Ukrprom also manufactures such systems with infrared rays as the heating source for domestic customers. In particular, it is especially convenient and profitable to operate the infrared ceiling heaters. Their advantage is the minimal investment. The heaters themselves are ceiling or wall-mounted infrared panels with the thickness of no more than 3-4 cm, which allows them to be mounted on any surface. There's no need for either maintenance costs of the heating system or the salary for employees serving this heating system because it is completely autonomous and controlled by thermoregulators. The principle of direct heating of objects' surfaces eliminates any heat loss, which can not be achieved using air heating of industrial premises. And if you want to heat selectively separate parts of a warehouse or a workshop, there's no alternative to the infrared heating. It can help you avoid the costs of the heating of the entire room and create a comfortable environment for workers (does not dry the air, there is no constant noise, vibration or drafts, which is impossible in the case of air heating of the workshop). The infrared heating system is presently the most effective heating system for large industrial workshops and warehouses, which must permanently maintain certain temperature as a such heating of industrial buildings works on the principle of Earth heating by sun rays. Also, the advantages of this type of heating system are its quick start-up, total noiselessness, a long operating life, the ability to create local zones of heating, saving up to 50% on the operation, as well as the minimum space occupied by system equipment.